The main tasks of 86th Chemical Brigade are to conduct training and be ready to fight; to provide chemical preventive measures for fighting at operational and strategic levels; to participate in the prevention and control of riots and terrorism, rescue and recovery from toxic chemical incidents, radioactive contamination, environmental pollution, and handling poisonous residues as the war aftermath in the North of Vietnam. 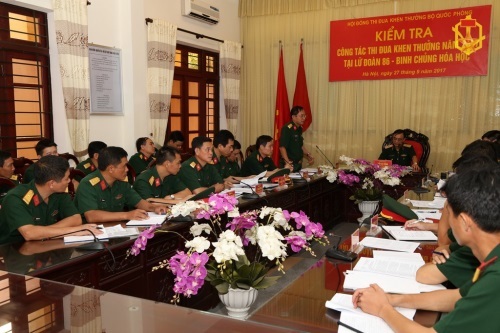 In the face of increasingly higher requirements and particularities of dangerous work, to fulfill all the assigned tasks, the brigade’s party committee and command have focused their leadership on building comprehensively strong Unit with a number of relevant and effective measures. First, attention is paid to building the politically and ideologically strong unit; considering it the key point to successfully accomplish all assigned tasks, particularly in situations when the soldiers are exposed to poisonous and dangerous areas. Therefore, the brigade has focused on strengthening its officers and soldiers’ political will, equipping them with unified perception and action, high determination in conducting assigned tasks. Besides closely implementing the contents of its annually political education, the brigade has also selected and supplemented topics that are associated with the tasks and functions of the unit, combining political education with the training of “good prevention, skillful fighting” tradition of the Chemical force to raise the soldiers’ pride and sense of responsibility. Moreover, the brigade has effectively implemented the grassroots democracy regulation. Quarterly, commanders join units to discuss with troops on the Political and Spiritual Day. As a result, party committees and commanders at all levels could understand their soldiers’ thoughts, opportunely solve emerging issues, and maintain internal unity and solidarity. Moreover, the movements such as the “determined to win movement” is carried out in combination with the studying and following of Ho Chi Minh’s thought, morality and style, and the movement of “promoting tradition, devoting talent, deserving Uncle Ho’s soldiers”. Officers and solders have more motivation to train themselves and to raise their political will in fulfilling all their assigned tasks. Thoroughly perceiving the role of all-level party committees in building comprehensively strong units, the brigade regularly focuses on the improvement of the leadership capability and combat strength of party committees, particularly those of units stationed separately from the brigade. To this end, attention is paid to renewing leadership styles of party committees, improving the quality of party meetings and the effectiveness of inspection and supervision, stepping up the management and education of party members in association with the building of cadre groups, promoting the exemplary role of cadres and party members, particularly key cadres at all levels. Therefore, annually, 95% of its party members have successfully accomplished their tasks; more than 80% of its party organizations are clean and strong ones. None of them fail to accomplish their tasks. Significance is also attached to the improvement of training. Considering it a key measure to enhance the efficiency and combat skills of the unit, the Brigade has effectively implemented the 765-NQ/DUTW Resolution of the Central Military Commission and the Resolution 174-NQ/ĐU of the Chemical Corps’ Party Committee on “enhancing the training quality in the 2013-2020 period and beyond”. In order to achieve the goals set by the Brigade’s specialized resolution on training task, a number of measures have been carried out, with a focus on the preparation work, the enhanced training for instructors, and the innovation of training management and inspection, etc. To successfully address contingencies, chemical incidents and fires, the brigade has updated and supplemented new training programs, closely followed the direction of superior command, and included the examination of the real situations in lesson plans. More specifically, it has included the content of “experience learnt from responding to and recovering from poisonous and radioactive chemical incidents” and “party and political work in responding to and recovering from poisonous and radioactive chemical incidents” in the lessons. During the course of training, importance is attached to the motto “basic, practical, and sustainable”. All soldiers and officers are trained synchronously and intensively. In this regard, attention is paid to the training of skills that are closely linked to the tasks of Chemical force, such as: anti-terrorism, treatment of poisons of war, settlement of toxic chemical incidents and radioactive agents, search and rescue. In addition, the brigade has also focused on training the solders to master weapons and equipment, particularly the new ones, as well as levels of training to make the solders able to operate at intensive level. Annually, the brigade carries out comprehensive exercise for units that are going to participate in combined exercises with other services, military regions and corps. As a result, the capability and combat skills of officers and soldiers are enhanced. In 2015, the brigade was awarded “good training unit” flag (2011-2015) of the Ministry of National Defence. Fully aware that discipline is the strength of the armed forces, the brigade attaches importance to standardization building discipline practice, considering this a breakthrough in the building of comprehensive strong unit. Accordingly, daily and weekly duties are strictly implemented in association with the strictly observance of military discipline and units’ regulations, thereby opportunely preventing and solving violations. Due to the fact that its force is assigned to different areas, the brigade always assigns officers to manage soldiers in all stationed places so that officers can opportunely understand the thinking and feeling of the soldiers, and seeks for the best ways to support them. In addition, the brigade has cooperated closely with local governments to opportunely address all related issues. As a result, since 2011, there has been no serious case of law and military discipline violation in its units; no soldiers have intentionally and illegally left the camps, and the number of minor discipline violations has reduced. Therefore, it has maintained absolute safety for the people and weapons. Besides, attention is also paid to the technical maintenance and logistics supply. As a technical unit, equipped with specialized weapons and equipment, most of which are out of date, the brigade has accelerated the movement of “good, safe and save management and exploitation of weapons and equipment, and traffic safety”; while encouraging soldiers to bring into play their self-reliant spirit to overcome difficulties and master all weapons and equipment, particularly the modern ones. In recent years, there have been technical innovations of the brigade’s soldiers and officers. The typical ones include: recce tactics training model; spraying system renovation for CDS-1000 Decontamination vehicle, etc. For logistics, importance is attached to the preservation of enough food and equipment for fighting, gardening activities and improvement of the living conditions for soldiers. By synchronously adopting the above-mentioned measures, in recent years, the brigade has successfully fulfilled all assigned tasks. As a result, in 2017, the brigade was honoured to receive First-Class Fatherland Protection Medal, awarded by the President. It is a meaningful award to celebrate the 40th founding anniversary of the Brigade (31/12/1977-31/12/2017).